I wonder if they make a two-foot version? has been converted from the pre-July 2008 WW&F Discussion Forum. That would be quite an experience at 49 mph. Looks pretty high tech for a port-a-potty. On the other hand, "the treated effluent is discharged directly to the roadbed." Don't think I want it on my railroad. I'm reading this on our Mac at home and there's no photo. Are there still gremlins in our server? Dave, here's the photo, hot-linked from the page...can you see it now? Aww, now the surprise is spoiled! The "Danger, Live Track" sign with the chain is to keep trackworkers from exiting the facilities and forgetting which way to exit the car (in double track territory). You don't want to step onto a live track and into the path of an oncoming train! Oh! Okay. Now I'm "tracking" with you. Hmmm. I remember a fantrip some years ago on which the last car was a gondolo that carried four Portajohns. 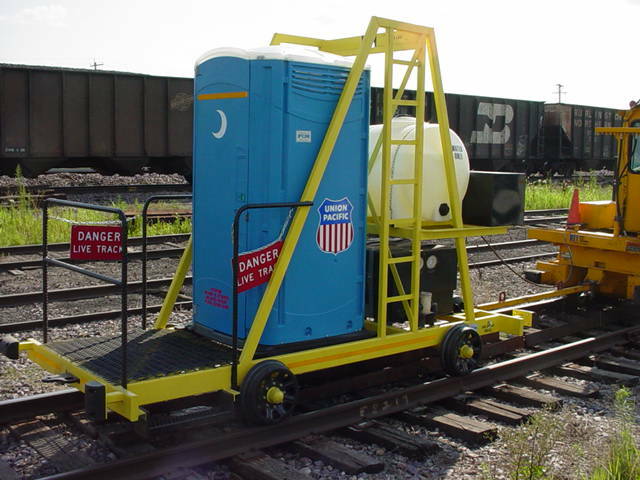 I also rode a trip once on which two Portajohns were transported inside a baggage car. In both cases, said arrangements were the only comfort facilities available to the passengers. I also noticed the water tank. Could this perhaps be used as a fire car as well? Gee what a rig !!!!!!! Does it come with 26 brake? Also with all the "Environmental" attachments would this also be considered a GEVO unit?